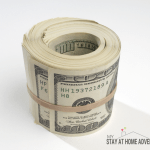 Your family can make extra money this month. Yes, you heard right. I said each one of your family members could do something that will bring extra cash to your home. You are here because you and your family are interested in making extra money this month! 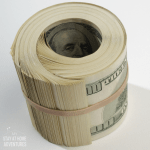 The truth is that your family can make extra money this month and if done correctly you can make over $500 with this long list of money making ideas available. The fun things are that the entire family can enjoy while making money which is the best part. Look we know that times are tough and creating ways to make extra money can lead to many benefits. Some of these benefits will be teaching your kids about responsibilities and money managements. For parents is a way to find a hobby that can turn into a real money maker. Take me for example; I started making extra cash with some of the things mentioned on this list. Never did I imagined that my blog was going to make over $11,000 in seven months. We have made an extra $16,000 last year from something that started because I wanted to record my stay at home journey once I left my job and also wanted to help others with their finances. As you can see you can find your calling doing these extra things for money and not look back! Another good point I want to bring into this is that having extra money around has its benefits and quite honestly it can bring peace of mind to every member of the household. To be able to make extra cash and save it and be able to pay for things without stressing over where the money is coming is a great feeling. Planning a vacation or simply saving for an emergency fund is a great reason to use these ideas and have your family make extra cash. Running a lemonade stand is a popular way for kids to earn money over spring break.During a family yard sale, have your children sell lemonade for extra money this season. Depending on the child's age, pet sitting family and friends’ pets will be a great way for them to earn some extra cash.For parents, this could be an excellent money maker too! If you love animals why not start pet sitting to earn some cash. You can start by asking friends or family or learn about online websites where you can make over $1000 by pet sitting! Below are resources to read to help you get started. Yard sales are one of my favorite ways for the entire family to make extra money over spring.We get rid of stuff we no longer need nor want, kids sell their lemonade and baked goods, and we all make money! How great is that? Create a household chore list and find them their age appropriate chores to do at home. 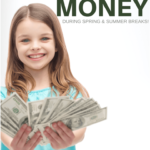 From cleaning an extra room to organizing areas of the house, this is a great way for kids to earn money. Depending on your kids' ages, have your kids babysit younger kids, or helping moms, or other parents is a good way of earning money. Assist the neighbors with their lawn, or even other family members with your yard is another way to make money. This depends on how old your child or children are and how comfortable they are operating a mower. If your kid loves pets, then dog walking will be another way to make extra cash. The bonus about this is that they will have fun and get to go out and exercise. During the yard sale, have your children sell their crafts for money. The crafts your child or children make may be say awesome; you might be able to sell their crafts online as well! There are many ways for children to earn money, and one of them is via playing games in Swagbucks. Though they will not get real cash, they will earn Swagbucks that will allow them to earn free gift cards to many of their favorite retailers and more. A car wash is another way for kids to earn money over the spring. Host a family and friend car wash and have the kids earn extra cash doing a car wash.
Other ways your family can make extra cash this month! Tons of online companies will pay you to take surveys and even play games! The truth is that some of these companies will earn you some cash but not as fast as you would like. Sometimes it can be a waste of time answering questions to see if you even qualify for the survey to find out that you didn't! Others though will reward you with points that can be exchanged for cash, gift cards, and other prizes! One of my favorites is Inbox Dollar. Inbox Dollars pays members to read emails, take surveys online, play games, and go shopping! There are plenty of reasons you should login and start earning points with Ebates! Shop and get paid when you use shop through Ebates simple as that! Another favorite of ours is My Points and quite honestly is so simple to earn points with them and earn extra cash. When you click this link you get a $10 gift card when you spend $20 or more. You can also shop stores like Groupon, eBay and more. You get Points for gift cards, award miles and more from over 75 top retail, restaurants, and travel partner. If you are lucky to have a nice size flea market around you area you can rent a table or space and take advantage of the traffic and sell your stuff there. You can learn more about selling items in a flea market by clicking here. There are many ways you can sell your items online. Sites like eBay and Craigslist are a great place to sell your stuff, but if you are in a hurry and want to sell it fast social media is another great place. Join local Yard Sale groups in Facebook and you will be able to see your items locally and fast which will save you on shipping cost. You can learn more information about the pros and cons of Consignment stores here. If you have unused or unwanted gift cards laying around sell them! Sites like Raise.com allow people to sell their gift cards or buy gift cards at a discounted price! You can learn more about selling unwanted gift cards by clicking here. Start selling t-shirts with Merch by Amazon. It's a print-on-demand (POD) service for t-shirts. Simply design and upload it and Amazon will take care of the rest. Learn how Michael Essek found success with it. You and your family can make money this summer! Who doesn't need the extra cash? 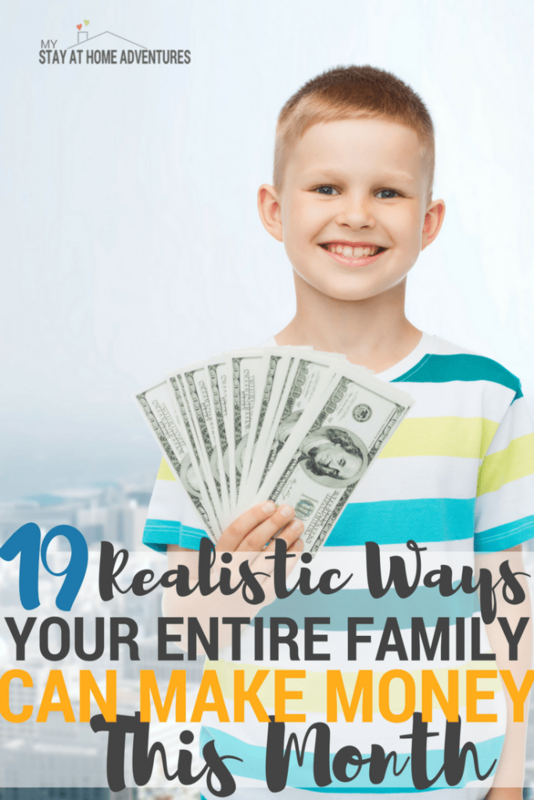 What I love about these ideas is that the whole family can do and will increase the extra amount of cash you can create. 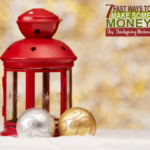 Now that you have ideas your family can make extra money this month, what are you going to do to start making money? Latina mom of 4 married to wonderful Greek gentleman. 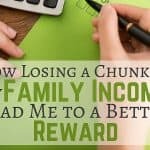 Living in southeast PA and trying to juggle family and a household while trying to earn an income from home. Follow my stay at home journey as I discover how to earn money and save money so we can continue to live debt free. Welcome to my blog, My Stay At Home Adventures. My name Joyce a Latina mom of 4 wonderful kids (18, 6, and 3, 4 months) who writes about her adventures at home.